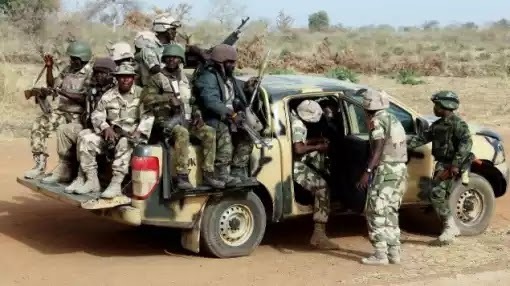 The Nigerian Army on Saturday said it had rescued six herdsmen abducted by Boko Haram insurgents at Kamuya community of Yobe State. A statement signed by Brig. Gen. Sani Kukasheka said that the rescued herdsmen were re-united with their families. Kukasheka said that the troops had killed two insurgents and recovered ammunition after a gun duel with the insurgents. “On Friday 8th September 2017, at about 7.30 a.m. troops of Defence Company, 27 Brigade Nigerian Army, on Operation LAFIYA DOLE deployed at Kamuya, Yobe State, received report from some herdsmen that suspected Boko Haram terrorists abducted six persons from their village. “The troops in conjunction with local vigilante familiar with the area trailed the terrorists up to Mangari village about 20 kilometres away from Kamuya. “The troops exchanged fire with the insurgents, neutralized two of them and rescued the abducted persons. The troops also recovered two AK-47 rifles. The rescued persons have been reunited with their family,” Kukasheka said. A Nigerian soldier “Charles Sea” who is currently on the warfront fighting Boko Haram shared a photo on social media of the grave where he sleeps daily. According to him, from that grave the wakes up every morning to carry out his daily duties. Happy sunday friends and my dear people of God. Thank God i made it today again in the land of the living , from this grave, I wake every morning to carry out my daily duty.